It’s never too late to start a new beginning in your life. Especially if you’re trying to move on and forget your tough days. First of all, This is an improved version of the one I used when I started my new beginning at 2017, and it's made for 2019 and 2020. I’ve added some tips to help you start. Some tools and ideas I’ve used on my new beginning. I put my heart when I made it because I know how it feels when you’re stuck in a maze of emotions or experiences that you can’t change but you need to do something to feel better. Sometimes you're just feeling lost and want to put an end to it, to stick a flag on this day and call it a new start. I hope it will help you as it did to me. – Guide and ideas pages. – weekly pages with “top priorities” and notes spaces. – Habit tracker for each month. – More few ideas and pages inside, let them be a surprise! 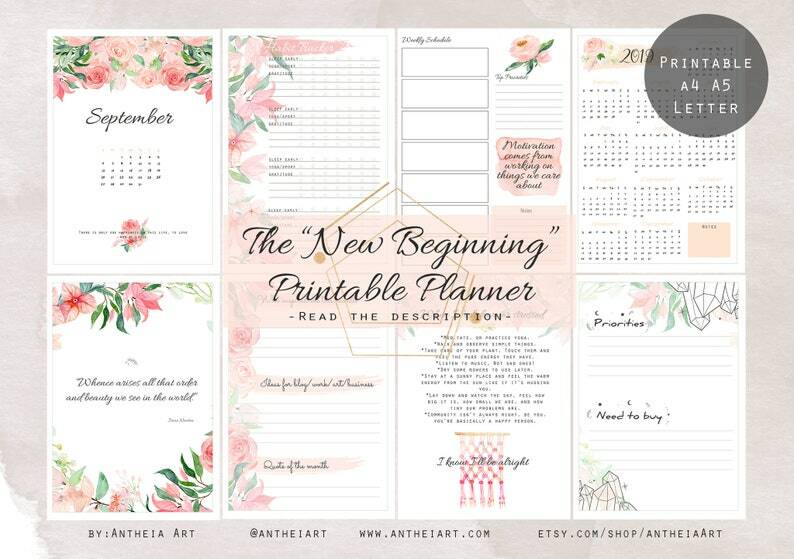 ✨✨ I wanna say that thinking of changing is your first step, you're meant to find this planner so don't you waste this chance. When the universe put something in your way you should pay an attention and hold that chance. Printable stickers, instant download, Watercolor Lunar set, for bullet journals and planners monthly spreads. Printable stickers, instant download, for bullet journals and planners monthly spreads. Printable stickers, instant download, for planners and journals use, Halloween decoration, witch cozy home.